Posted on September 16, 2011, in Bible, Haiku My Heart, Monday Poetry Train Revisited, my digital photos, my senryu, Scripture, The Height of Haiku Challenge. Bookmark the permalink. 12 Comments. 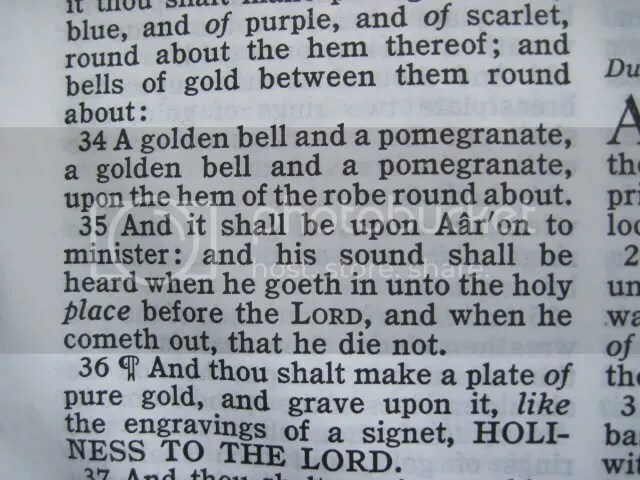 Yes, and one such golden bell was discovered in Jerusalem this summer! Good one today, loved it!! I can almost see and hear the bells! Beautiful haiku! They just don’t make robes like they used to, do they? Great use of the language and creative usage for ‘chime’. I’m nerby and waving as we pass. Your haiku is so beautifully written today…chiming praise to God…glorious! I love the sound of the bells Indian women sometimes wear. So soft and light. Very Nice Haiku. I love your haiku today, especially the line “stitched in golden bells”. This is your psalm today, and now mine, too.